Well, we have been waiting anxiously to see when the latest Google Panda algorithm update will hit and it looks like we have to wait a little longer. 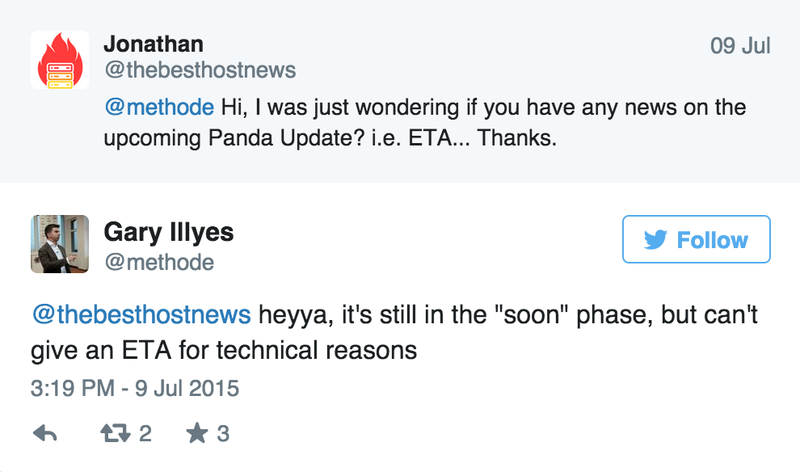 On July 9th, 2015 Google Webmaster Trends Analyst Gary IIlyes confirmed that Panda is in the “soon” phase. From personal experience, I have seen a few “bounces” in search rankings for my clients recently. Google is known to test changes while users are often not on the Internet. Nights and weekends are prime time for Google to turn the knob on something that will go live in the upcoming weeks of months. We may get a taste of the Google Panda update this weekend. I will be sure to keep you posted if I see anything. I have no idea what to expect with this update. I don’t think it is going to crush a ton of business websites but we never know with Google. Remember that Panda is the the update that “aims to remove low quality content from the SERP on a continual basis. These updates mark and remove redundant, irrelevant content and spam from Google’s index and SERP.” For more on Panda vs Penguin use the link. Content farms and low quality content sites have been whacked by the Google Panda update throughout the years. Look for this Panda update to continue to encourage quality content. If you have a business website that is producing a large amount of 150 word articles that have no value you are going to find that a future Google Panda update hits your website. The Google Panda update is not focused on over optimization, that is the Google Penguin update. That said, it is always best to simply create great content and receive natural links pointing back to your website. If you need help with SEO or content feel free to reach out to me at jwojdylo@gmail.com. I have monthly SEO and content packages that can help your business website rank better in Google Search.